Today is Hanukkah Eve and over the next 8 days, many presents will be opened, many candles will be lit, and many calories will be consumed. Hanukkah is a very happy holiday, especially for the little ones! The traditional food served makes it an especially fun (and fattening) one. Even if you don’t light a menorah, you can still enjoy the delectable treats traditionally served during this wonderful time of year. When I am preparing a Hanukkah feast, or any other Jewish holiday meal, there are two places I go to for recipes and ideas. The first is my mother-in-law. She is a fantastic cook and has shared many of her delicious family recipes with me over the years. My other recipe resource is the cookbook Fast & Festive Meals for the Jewish Holidays by Marlene Sorosky. You don’t have to be Jewish (or even a Cashew) to love and appreciate these recipes. In mixing bowl, combine beaten eggs and onion. Cut cleaned potatoes and grate or shred in the food processor. Add to egg mixture and add matzo meal, baking powder, salt, and pepper. Serve with sour cream or apple sauce! Preheat oven for 300 degrees. 3-4 lbs of first-cut flat-piece of brisket. Combine the ketchup, water, mustard, wine vinegar, dried minced onion, and horseradish and whisk together. Place the brisket in a roast pan or glass dish and cover the meat with the combined mixture. Cover the brisket loosely with foil and cook slowly at 300 degrees. It takes about 4 hours to cook, depending on the size of the brisket and your oven. It’s done when the meat is tender enough to be cut with a fork. If it’s too tough, keep cooking! The brisket can be cooked the night before and refrigerated. To reheat, first discard the solidified fat and carve the meat. Slice brisket thinly against the grain. Bake in the oven at 325 or 350 degrees, covered, for about 40-50 minutes. is it Hanukah already? Have a wonderful holiday. While not Jewish or Cashew, I still love a great brisket. I will definitely give your version a try. I can't believe it's here already. I still have Halloween decorations to put away! This brisket is so easy and delicious. If you give it a try, let me know how it went! Thanks for this recipe, I’m very glad to have it! We aren’t Jewish, but my son loves latkes having enjoyed them at a friend’s house last year. I might have to try them myself because really, how can fried potatoes be wrong? yum, thanks for sharing! A friend of mine told me she makes latkas while wearing a hoodie over her hair and sunglasses on, to keep away any grease! Found you on SITS, have a great holiday! I love brisket. I’ll have to try that recipe. SITS sent me! Have a great holiday. This looks like a good recipe. I love brisket and latkes! Can’t wait to see your Hanukkah pics! Chag sameach. Looking forward to my own brisket and latkes. Yum. Love the recipes. Just stopping by to say hi from SITS. Now I’m hungry! Happy Hanukkah — and SITs Sharefest! 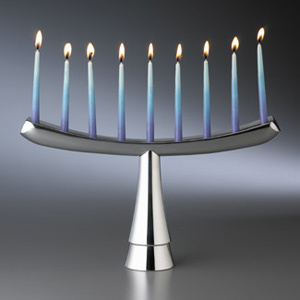 That is a really attractive Menorah. Very sharp. Hope your holiday is a great one…and thanks for the recipes! Woot! That sounds really really good. Have a happy Hanukkah! i LOVE that menorah. i had a cute one. the shemash was a circus tent and there were 8 little circus animals that circled it. it met a horrible fate(long story). now, i use a menorah that my son made in preschool. it’s cute! but i want that menorah! !